Aaron W. Hughes received his Ph.D. at Indiana University only 10 years ago; since then he has been nothing short of prolific. The books to his name include The Texture of the Divine (Indiana University Press, 2003), Jewish Philosophy A-Z (Palgrave, 2006), The Art of Dialogue in Jewish Philosophy (Indiana University Press, 2007), Situating Islam (Equinox Publishing, 2007), The Invention of Jewish Identity (Indiana University Press, 2010), as well as a handful of edited volumes, including Defining Judaism: A Reader (Equinox Publishing, 2010). Hughes currently teaches at the University of Buffalo, where he holds three titles: Associate Professor, Department of History; Gordon and Gretchen Gross Professor of Jewish Studies; and Associate Director, Institute of Jewish Thought and Heritage. Neither the Orientalist nor the apologist approach … provides a proper understanding of something called Islam precisely because no such thing can exist. Despite appeals to the contrary by either practitioners or scholars of the tradition, Islam, like any other religious tradition, is a series of sites of contestation, where regimes of perceived truth do battle against other such regimes in the service of something murkily called authority, tradition, or authenticity. It is no surprise that we then get a chapter titled, “We Study Muslim Constructions, Not Muslims, Right?” Since this sort of thing is right up my alley, I loved Situating Islam—so I was happy that Hughes was willing to submit to an interview with me. Craig Martin: What prompted you to write Situating Islam? Who was your target audience and what did you hope to accomplish? 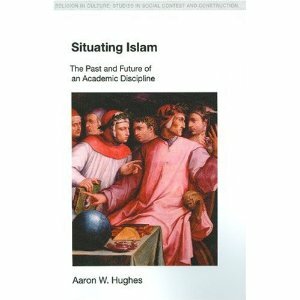 Aaron W. Hughes: The catalyst for writing the book came from my growing (and still growing) dissatisfaction with the academic study of Islam, especially what I consider to be its overly apologetical stance and its general unwillingness to engage seriously the critical discourses associated with the study of religion. Let me state at the outset that by “critical” I refer to those discourses that query the utility of traditional terms and categories, and that refuse to recycle the liberal Protestant ecumenicism that has habitually passed for theory and method in the past. It frustrates me that we should spend ten years in graduate school only to emerge as color commentators of Muslim life and practice. Any Muslim can do this. Related to this was the fact that two weeks into my first job the attacks of 9/11 occurred. I watched as my colleagues (both in Islam and Religious Studies more generally) did all sorts of ridiculous hermeneutical somersaults to locate authentic religious expression and belief. “Real” religious people could not perform such actions; they had to be “hijackers” of the religion. And then all these books started coming out by people like John Esposito, Karen Armstrong, and Seyyed Hossein Nasr that further essentialized Islam. I had had enough! Situating Islam was my attempt to try and offer some corrective to the regnant discourses of the field. My target audience was twofold. The first audience was those engaged in the theoretical study of religion: I wanted to show them that all was not moribund in the academic study of Islam. The second audience was those in Islam: to show them that there was a larger theoretical world out there that has the potential to make us reframe our interpretive lenses and recalibrate our questions. Basically, I wanted to—and indeed still want to—bring these two audiences together. This may well be an impossible task. But I thought that if I could start this rapprochement, others might pick up on it. Let me be clear: I am not saying that the academic study of Islam is lame, only that we need to rehabilitate its more apologetical tendencies by connecting it to larger disciplinary sets of issues. I am worried that most of the apologetical ranting goes on at the introductory level so that an entire generation of university students will possess no critical skills when it comes to dealing with Islam—and then think of the repercussions of this when some of these students go on to become journalists, initiators of public policy, government officials. CM: Are there any parts of the book that you find particularly strong, or of which you’re especially proud? Are there any parts of the book that you wish you had written differently or developed more thoroughly? AWH: I didn’t want to spend 5-10 years writing the book. So it is somewhat impressionistic. This is both the strength of the book and its potential weakness. It is a short work (135 pages) that, to quote one reviewer, “packs a sizable punch.” But to show you what I am up against another reviewer said the book could not be taken seriously because I only have 8-10 footnotes per chapter (this reviewer, of course, forgot to mention that I use MLA style for the rest of my citations)! I am proud of several things. The first is that it really is meant as a provocation. I don’t think that anyone in Islamic Studies will read this and not think seriously about the theoretical (or lack thereof) issues of the discipline and its disciplinarity. Secondly, I am proud of the fact that in this relatively short space I isolate a problem, articulate it, and follow it through a specific historical period. I have received numerous emails from people (grad students and other faculty) that have said they really appreciate what I have tried to do here. Thirdly, I am also proud of the fact that I am attempting to, if not redefine, then at least decenter the regnant discourses of the discipline. I was really hoping that Situating Islam might have been a book that a panel at the AAR or NAASR addressed, or that was part of a book review forum in a journal. As for what I might have done differently, I wish that I had maybe expanded my last chapter, which is constructive by nature, to show more clearly how the study of Islam has the potential to make positive in-roads into the academic study of religion. But this will be for another time …. CM: Where would you situate your book in relationship to other scholars or scholarship? I.e., is this book easily aligned with or against any particular scholars or schools of thought? AWH: I am a (good natured) contrarian by nature. I have always enjoyed the intellectual company of the likes of Russell McCutcheon, Bill Arnal, Bruce Lincoln, Don Weibe, and Jonathan Z. Smith. In many ways, I hope that I am doing for the study of Islam what they have done for their respective disciplines and subfields. It is my desire is to be part of a larger group within Religious Studies that is questioning traditional axioms and exposing as halftruths all that the discipline has held to be true. As for those the book is aligned against, I would have to say the entire apologetical and liberal Protestant interpretation of Islam. Needless to say, this does not always make me popular in Islamic Studies circles. Those who talk about not offending Muslim sensibilities as an excuse to avoid talking about the redaction history of the Qur’an or the historical Muhammad; those who want to define an “authentic” Islam (that is liberal, peaceful, and democratic); those who put together AAR panels wherein liberal Muslim academics talk about their experiences and vision of their particular version of Islam. I rail against all of this. None of this is scholarship, but theology and ecumenicism, which I personally do not have a problem with so long as those doing it make it clear to others that this is what they are doing. Too much slippage between scholarship and apologetics occurs in Islamic Studies for my liking. On some levels, this is reflective of the discipline of Religious Studies more generally, but I try to criticize it from my particular point-of-view. CM: In your book you discuss at length how “Islam” is introduced in undergraduate textbooks. Can you comment on how you introduce “Islam” in your introductory courses? If you were going to write an intro textbook what would it look like? AWH: Funny you should ask that. I am in the process of putting the finishing touches on an introductory, non-apologetical textbook called Muslim Identities: A Historical Introduction. I think that the plural nature of the second word in the title gives away my hermeneutic. Its intent is to present Islam non-apologetically and from the perspective of identity formation and maintenance. I intend to introduce students to topics that have traditionally been left out of introductory texts (because they have ideologically and pejoratively been written off as “Orientalist”), especially all the issues that emerge from the thorny problems associated with Islamic origins (basically we know nothing about the first 150-200 years, but pretend we do because later sources tell us about them). Rather than say, like some, that it is all a later fabrication, I prefer to see these years through the prism of later generations creating manifold identities for themselves in the light of unruly social worlds. I argue that the exact same processes go on in the modern and postmodern worlds. Theoretically, both my approach in the classroom and my textbook emerge from those critical discourses that stress the imprecision and messiness of traditional terms such as “religion,” “spirituality,” or “experience.” I prefer to see religion in general and Islam in particular as a set of social and cultural facts that are imagined, manipulated, and contested by various actors and groups throughout history. The book does not assume that a monolithic and essential “Islam” exists, and differs only in its “manifestations” owing to cultural idiosyncrasies. On the contrary, it regards Islamic identity—like any identity—as actively constructed and imagined. CM: How has your theoretical approach (i.e., your trenchant anti-essentialism) in general influenced your teaching? Can you comment on whether your students are receptive or resistant to your ideas? AWH: It is true that most students like essentialism, especially the idea that identity is something that they are born with and that this gives their lives meaning and direction. Any attempt to dislodge such notions—to suggest that identities (cultural, ethnic, religious) are invented or, at least, actively created by individuals and groups are potentially problematic. By way of an example: I regularly teach a course entitled “A Historical Introduction to Judaism,” wherein I try to show undergraduates that Judaism is actively produced in a way that is contingent upon the category of the non-Jewish. This is not in some Hegelian sense in which “the Jew” derives its meaning by opposition to “the non-Jew”; rather, the very techniques, methods, and languages responsible for imagining diverse Jewish identities are ultimately non-Jewish. Rather than uphold reified borders between “Jewish” and “non-Jewish”—borders that are often constructed and projected retroactively—I prefer to examine their fluidity. In so doing, I contend that the project to extend knowledge of “Judaism” succeeds in othering Judaism to itself, so that ultimately the very goal of maintaining Jewish distinctiveness ends up collapsing upon itself. Indeed, through all these permutations the category of “Judaism” remains beautifully and necessarily unstable. More practically, this obviously has major repercussions on students. For Jewish students, it shows them (ideally) that their identity is not something that they check off on a list (Jewish day school, summer camp, bar/bat mitzvah, support for Israel), but is something that others create for them on the basis of perceived normativity and what it means to be authentically Jewish. I thus spend a lot of time on the Conversos, who made their way from Spain and Portugal to Europe and, quite literally, invented a Judaism for themselves. For non-Jewish students, the goal is to get them to see that the processes at work in Judaism (e.g., its historical diasporic nature) are at work in the formation and maintenance of all cultural, religious, and national identities. Do I get through to them? One can only hope! CM: What theorists or what books do you think people should be reading right now in religious studies (other than your book, of course!)? AWH: After all these years, I still think the essays of J. Z. Smith repay close readings. However, I sometimes worry that a new generation will simply invoke Smith’s name as code for the fact that they know (or think they know) and get (or think they get) “theory” in Religious Studies. (I have seen this done many times in job interviews with candidates.) The work of J. Z. Smith, then, should not be seen as the final word in theorizing—something he would never want—but a point of departure for a lifetime of thinking through and about our various data-sets. Having said this, however, I do think that theorizing in Religious Studies is about twenty years behind the times when compared with some other disciplines. I mean we are still reading Foucault, Bourdieu, and others, whose works were published over thirty years ago. However, I do think Bourdieu’s Distinction is still magnificent. I do think it is important for us in Religious Studies to keep up on recent trends in Continental Philosophy and Critical Theory (which, in literature circles, means something much different from what we are accustomed to in Religious Studies). Recently I have been reading Jean Baudrillard’s The Vital Illusion and Alain Badiou’s Theory of the Subject. They are a bit jargony for my liking, but nevertheless helpful in thinking through issues of subjectivity and invention. I have also just finished a wonderful book by Jonathan Boyarin entitled The Unconverted Self: Jews, Indians, and the Identity of Christian Europe. On a related note, I must confess that I have very little time for a direction that I see much theorizing in Religious Studies going today. I refer to the discourses surrounding Science and Religion. The movement of theory out of the cultural and humanistic realms into the pseudo-scientific strikes me as fruitless and even dangerous for future theorizing in Religious Studies. The fact that some think we can decode religion or map it in the brain does not seem particularly helpful for how I conceive of the discipline. CM: You have a forthcoming book called Situating Judaism; can you comment on its contents, and what relationship it has to Situating Islam? AWH: I am still working on that book, so instead let me briefly comment on a new book of mine that is forthcoming in the fall of 2010, The Invention of Jewish Identity: Bible, Philosophy, and the Art of Translation. In it, I try to argue that the translation of the Bible into other idioms represents a basic human struggle with time, language, and the space that opens up in-between. Such struggles inevitably cluster around dual or competing identities and what goes on in the hyphenated space that connects such identities (e.g., “Jewish-American” or “French-Muslim”). The hyphen assumes a certain kind of translation of cultures, languages, and temporal frameworks—frameworks that all the authors I examine confronted and, successfully or unsuccessfully, tried to mediate. It is in the hyphen, the so-called space in between, that real creative and imaginative work occurs. More specifically, the instability of Bible translation reveals that time is not some substantial thing out there. Rather, this notion of time—whether we label it as sacred history or the like—is not something in which we passively participate. On the contrary, it depends upon various investments or activities of persons in a culture and, in this regard, Bible translation shows that categories such as the “sacred” or the “holy” are constructed out of retrievals of the past in anticipation of a certain future in order to make a certain identity present at this moment. This relates to Situating Islam, I suppose, because it is again driven by an anti-essentialism and a need to reframe earlier discourses. I am, however, less interested in the issue of disciplinarity in this book, and more interested in that of temporality as the locus of cultural formation and maintenance. Whereas in the earlier book my main data-set was the utterances of professional Islamicists (what we customarily and problematically call “secondary sources”), the new book examines “primary sources” from the longue durée of Jewish philosophical writing. CM: Wild card question: What question do you wish I had asked you? AWH: I don’t know. But questions that I have been thinking about lately (without attempting to answer here) include: What is the future of study of Islam (sometimes I insert: Religion or the Humanities) at this particular historical and economic moment? Is there a future for what we do or think we do? How can we undermine the status quo (instead of developing a science envy as some are currently doing)? What is the future of graduate studies in Religion? Is it worth wasting ten-twelve years of our lives just to provide color commentary to the lives of those who call themselves religious? And, especially in Islamic Studies, how can we take interdisciplinarity seriously when disciplines police their borders the way they do?